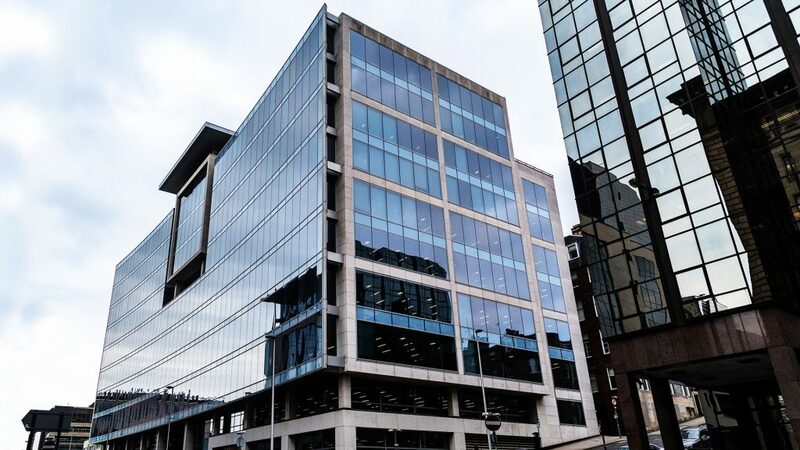 Located on one of Glasgow’s premier business addresses, the Aurora Building provides circa 180,000ft2 of high quality office space with magnificent views of the southern part of the city from the building’s signature curved glass façade. Colville House was a 1960’s office block on Bothwell Street, which was demolished to make way for an entirely the new Aurora building which occupies the entire length of a city block and is 10 storeys tall. The new building is situated on a steep hill rising northwards. In order to maximise parking provision, we designed a double basement served by car lifts for access. The substructure works were further complicated by the steep rise on the site we designed a full pro le contiguous piled wall basement structure to act as a braced box to mitigate the issues. The superstructure is a steel framed solution with a concrete core on the rear wall; the internal layout has a single line of mid span columns to provide flexible space and feature circular steel columns creating the curved glass front elevation. The project has created one of the most prestigious office spaces in the city.